As a child, Jonah Guelzo always had a love for film. His older brothers awould film Star Wars movies with Kenner action figures on an old VHS camcorder using fishing line to move their plastic figures around a scene. This love just kind of naturally progressed as he got older. He soon became more involved in the video side of things, but always tried to mess around putting fun sound fx into his family's terrible home movies. Unknowingly, he started gravitating more and more towards the aural aspect. It became more real to him just how important sound was and how he could transform a pretty terrible looking short film, giving it a larger than life quality via some very basic sound design. You seem to be very much involved in video, having cut commercials, documentaries and you are currently finishing up your first feature film edit. But how did you first get into sound? I landed a job at TODD|Soundelux which was at the time, one of the very few large independent post sound companies. During my time there I got to work directly with Peter Berg (Director of “Lone Survivor”), Damon Lindeloff (Writer of “Lost”) and Ryan Gosling (Actor in “Crash” and “The Place Beyond The Pines”) among others. Very quickly I was blessed to be able to work alongside such incredible supervising sound editors like Lon Bender (“Braveheart” and “Hunger Games”), Wylie Stateman (“Django” and “Lone Survivor”), Peter Brown (“The Fast And The Furious”) and many more. Whether that involved me going out in the middle of the desert recording 5.1 recordings of wind farms for Divergent, 12k feet high in the Colorado mountains recording the vehicles for Furious 7, recording interesting sound design elements for Robocop’s iconic robotic suit sound, sound designing the pilot episode for HBO’s Leftovers, various high-profile commercials for AT&T and Lamborghini, in a very short amount of time I’ve really been able to learn and grow as a post sound guy, having grown my knowledge being surrounded by talent that greatly surpasses my own. What films have you been working on recently? We’re guessing that you’ve managed to keep relatively busy as always? "Using Revoice Pro 3, I was able to reference all of the guide audio, and after finding bits and pieces of wild lines and occasional takes from other shots during the scene, I was able to conform the wild lines to very closely match the original inflection and timing of the original lines. Watching the scene back, you can’t even tell that I used almost entirely wild lines because of the sync being so spot on." I’m currently co-producing a documentary about returning a World War 2 hand-forged Japanese sword to its original owner, sound supervising two independent feature films with a good producer friend of mine, following the adventures of a cop and minister (“Crossing Streets” - crossingstreetsfilm.com) and a romantic comedy about a girl called Maddie (Cassi Thomson from “Left Behind”), trying to win back her childhood love Bobby Browning in the film “Where are You Bobby Browning” (Matt Dallas from “Kyle XY”) as well as a science fiction film about time-travel surrounding the adventures of a man in search of himself in the film Norman (normanthefilm.com) directed by my older brother. What did you find most useful about working with Revoice Pro 3? When it comes to indie feature films, you HAVE to be resourceful and make the best out of your circumstances. Ideally, it’s always best to be very intentional about your shooting locations and how controlled they can be during filming for sound purposes. However, with “Crossing Streets” and “Where are You Bobby Browning”, we didn’t always have the ability to work within a very sound-controlled environment. Having production sound mixed on location for both films, I knew how to maximise each space in regards to sound, but we inevitably had some very poor sounding locations. We had to record next to a busy street, a noisy convenience store, a police department where all the A/C was controlled remotely in some other state and other less than ideal recording situations. To save money on the backend and to avoid having to spend money bringing back costly Actors for ADR recording sessions, I would pull actors away to a quieter area that still sounded acoustically appropriate to the scene and then get them to record wild lines for me with a view to somehow piecing them together to reconstitute some terrible on-set sounding scenes. I’m always on the lookout for new innovative ways of going about post sound and finding ways to be able to utilise the better performance and feel of the dialog recordings recorded on set. One of my ‘go to’ plugins for post is Izotope’s RX4 advanced restoration plugin. I absolutely could not live without it when it comes to tastefully de-noising recordings, EQ matching for Lav/Boom tracks, removing unwanted background sounds and more. Equally just as unbelievably useful in my goal to maximise the use of all my dialog recordings on set is Synchro Arts’ Revoice Pro 3 plugin and stand alone application. It has allowed me to reference the pitch and pacing of a piece of recorded dialog on set and then using the calculations from such to then impress upon another dialog recording from another take - void of troublesome distracting sounds or a clean wild line. When it came to some problematic scenes in “Crossing Streets”, I was almost able to entirely reconstitute a particular scene using only wild lines I recorded between company moves. Recording these right after a scene allows those lines to still be said, retaining most of the emotional content that was recorded while the camera was rolling. However, it was hit and miss as to how the actors would deliver their lines in terms of their pacing and inflection. So while it’s relatively easy to match back wild lines consisting of just a word or two, it’s a whole different ball game working with longer lines. Using Revoice Pro 3, I was able to reference all of the guide audio, and after finding bits and pieces of wild lines and occasional takes from other shots during the scene, I was able to conform the wild lines to very closely match the original inflection and timing of the original lines. Watching the scene back, you can’t even tell that I used almost entirely wild lines because of the sync being so spot on. Even in instances where we recorded some dialog via a wide shot where my boom operator couldn't get in close, and where technically I had very usable personal microphone recordings to work with, I found myself turning to Revoice Pro 3 to analyse a closer take where we could snag the line full bodied. Then, using the personal microphone dialog track, I could conform the fuller sounding boom track to the pitch and time of the radio microphone source. Just like when restoring recordings with Izotope’s RX4 advanced, with Revoice Pro 3 you have to find that healthy balance of how far you can push your recordings before you start to hear digital noise or digital artifacting in your recordings. But when matching back more closely-related dialog material to be conformed to the original guides, the results you get with RVP3 are absolutely unbelievable! Sometimes, I’ll do multiple conform passes before the conformed piece of dialog feels just right. With full featured access to pitch and time parameters within the application, it’s easy to tailor things to get the best performance out of the new lines that you can, without mangling anything too far out of that healthy middle ground. "It’s absolutely paramount that young directors and producers start realising the incredible importance of sound. Sound is often the cheapest but yet most effective way of elevating your movie going experience." I love the standalone application for dealing with more difficult dialog conforming situations because I can really get my fingers dirty when adjusting how the pitch and time parameters affect the dub track. However, I really love using the APT plugin within Pro Tools. Sometimes a dub track that I need to conform to the timing of the guide audio I’m using is much more similar overall, so it’s easy to use the plugin to get some great quick but very effective results by simply clicking just a few buttons and not messing about with the more detailed parameters you’ll want to utilise in more demanding situations. The ability to really hone in on parameters with the standalone while also having a quick and dirty way of just moving along in the dialog edit in less demanding situations is definitely a ‘having some cake and eating it too’ situation. The best of both worlds. After working on some great films and with various well-known actors over the years, what’s the most valuable piece of advice you would pass on to those starting out in your field? You have to learn how to be a diplomat on set as well as behind-the-scenes. As a production sound mixer and a sound supervisor specifically, you have to learn how to garner the trust of your co-workers. Whether that might be helping the director transform his vision into a reality or working with well-known actors to gain their respect. It could be making slight adjustments on set to help ensure cleaner sounding dialog, or developing relationships with producers to keep things within budget and finishing up the job in a timely fashion. The more you can really try to understand those you are working with by befriending them, the better your work environment will be. I’m never anti-director, anti-actor, anti anything. I’m PRO the film and when the director/actor realizes that your ultimate goal is to ensure their film will have the best chance of success, you’ll find that they’ll start to pay more attention, heed your suggestions and start thinking about and respecting how sound can make a profound positive affect on their story. "You have to learn how to be a diplomat on set as well as behind-the-scenes. 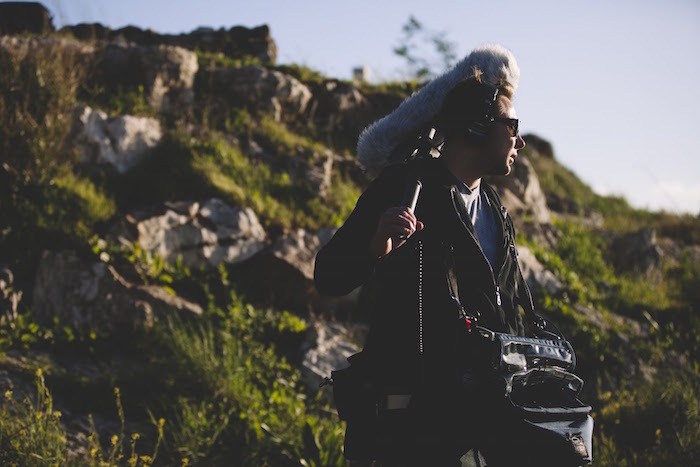 As a production sound mixer and a sound supervisor specifically, you have to learn how to garner the trust of your co-workers." It’s absolutely paramount that young directors and producers start realising the incredible importance of sound. Sound is often the cheapest but yet most effective way of elevating your movie going experience. Too often, directors and producers focus on simply the CAMERA and pay little to no attention to sound (especially sound gathered on set), only to find that they’ve made a grave mistake when they get to post sound, have run out of money and realise what money they do have will all be spent to just “fix” things in post - instead of spending time being creative with the mix. The sweet spot of life is right in the middle. It can’t be all about sound, and it can’t be all about the camera. At the end of the day, your audience will be much more willing to forgive less than perfect visuals if accompanying it is a very professionally done and intentionally created soundtrack. But even at a subconscious level, terrible sound along with even the most dynamic visuals will disengage viewers. Sound grounds the visuals and gives them a tangible quality. The sooner you put more importance on sound and realise that video and audio within the movie going experience are equals, the sooner you’ll realise the incredible possibilities that lay before you. Not only will sound guys love you and spend their time coming up with incredible suggestions on how they can better support the story through sound, the more you’ll be taken serious in the film world with your peers and from your audience. Don’t be another statistic adding to the already very real stereotype that indie films always sound horrible. As a video editor as well, I play sound effects in my head which dramatically affect how I play out scenes in the edit, building in wonderful opportunities to tell stories in entirely different ways using sound as the vehicle to do so. Excellent! Thanks for sharing your fascinating insights and experience with us Jonah! Get engaged with sound. Follow Jonah on Twitter @jbguelzo and bobbyguelz on Instagram.